"Halls Creek" redirects here. For other uses, see Halls Creek (disambiguation). Halls Creek is a town situated in the East Kimberley region of Western Australia. It is located between the towns of Fitzroy Crossing and Turkey Creek (Warmun) on the Great Northern Highway. It is the only sizeable town for 600 km on the Highway. Halls Creek is also the northern end of the Canning Stock Route, which runs 1,850 km through the Great Sandy Desert until the southern end of the route at Wiluna. The town functions as a major hub for the local indigenous population and as a support centre for cattle stations in the area. Halls Creek is the administration centre for Halls Creek Shire Council. The land now known as Halls Creek has been occupied for thousands of years. The land is crossed by songlines and trading paths stretching from the coasts to the deserts, some passing near the modern town. The story of that long occupation remains alive today and it is revealed in the culture of the Jaru, Kija, Kukatja, Walmajarri, Gooniyandi and other indigenous people who live in Halls Creek shire. Late in the 19th Century, Europeans arrived, searching for land for cattle and sheep, as well as minerals. On Christmas Day 1885 prospector Charlie Hall found a huge 870-gram (28-troy-ounce) gold nugget at a site that would eventually be named after him. News of the discovery drew more than 15,000 people to what is now Old Halls Creek to try their luck. It proved an inhospitable land for these people and the graves of some can be found in Old Town's small cemetery. 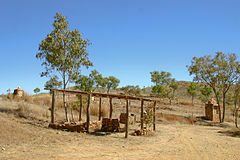 The gold rush lasted less than 3 months and Halls Creek became a trading centre for cattle stations, aboriginal communities and miners who stayed in the area. The post office with its telegraph line that terminated here, the police station, government office, racecourse and stores gave the town a purpose. In 1918 the Australian Inland Mission built a hospital and the old town struggled on, short of inhabitants and water. In 1948 an airfield was built near the site of the present town and over the next decade the old town moved nearer to this new site. Except for the police station, which finally relocated in 1961, the old town was abandoned by 1954. Purnululu National Park (the Bungle Bungles), 120 km to the north. Many talented artists producing Indigenous Australian art live in Halls Creek and the surrounding communities. Visitors will be surprised at the huge variety of styles coming out of the region. It's not uncommon to buy artwork directly from the artist, so having cash handy can be useful. There are also multiple art centres within the Shire of Halls Creek, where you can meet the artists and purchase unique works of Kimberley art. There are alcohol restrictions within Halls Creek. In May 2009 the state Director of Liquor Licensing imposed a "prohibition on the sale of packaged liquor with an alcohol content greater than 2.7 per cent from licensed premises" in the town. In September 2009 it was reported that assaults and drink driving arrests had decreased dramatically as a result of the bans. Full strength alcohol can be purchased with a meal at the local motel or hotel, however take-away sales of alcohol above 2.7% Alc./Vol. are prohibited. Halls Creek has two distinct seasons, the wet season (November - March) and the dry season (April - October). Permanent surface water sources are scarce during the dry season. Always carry plenty of water. During the wet season, Halls Creek is often cut off due to flooding. People traveling during the wet should be extremely cautious of flood ways and bridges, as water levels can rise and fall very rapidly. Permits are required in some areas and permission should always be sought before visiting Aboriginal communities. Always seek local advice and never travel on a closed road. Aside from the well known and well preserved Wolfe Creek Crater, averaging about 875 metres in diameter, nearby there is also Goat Paddock crater, 7 km in diameter and 106 km west-southwest of Halls Creek, and Piccaninny crater, 7 km in diameter, within the Purnululu (Bungle Bungle) National Park. Near the other end of the Tanami Road in the Northern Territory, over 1000 km away from Halls Creek, is Gosses Bluff crater, with the 5 km diameter, 180 m high crater-like feature, now exposed, being interpreted as the eroded relic of the crater's central uplift. In the 2016 Census, there were 1,546 people in Halls Creek. Aboriginal and Torres Strait Islander people made up 66.9% of the population. It is home to the Indigenous Jaru (Djar-u) and Kija (gKid-ja) peoples as well as some Tjurabalan peoples from the desert to the south of the town. Indigenous people represent over 70% of the town's population and have lived in the region for at least 30,000 years. "Aboriginal people in Halls Creek are predominantly Jaru and Kija peoples. Many residents celebrate both Jaru and Kija heritage. there are also significant numbers of Gooniyandi people from further east, Walmajarri from the south-east and Kukatja people originally from the desert country to the south. Over the years other Aboriginal people from nearby groups have moved to Halls Creek. These include the Gurindji and the Walpiri from the east, the Ngardi from the south-east and Malngin from the north-east". As of November 2018[update] the Browns Range Project pilot plant—160 km south east of the township near the Kundat Djaru Community—is producing 50 tonnes (49 long tons) per annum of dysprosium. With mining companies surveying the area for its iron ore, the Shire Of Halls creek is set to become the fastest growing settlement in the state. The town is expected to quadruple in size by 2016 if the mining corporations go ahead with their exploration for Iron Ore in the area. The commercial industry in the small town is projected to grow massively, with McDonald's, Woolworths, Coles, Kmart and many other stores planning to develop if the mining companies choose to mine in the surrounding area. ^ a b Australian Bureau of Statistics (27 June 2017). "Halls Creek (L) (Urban Centre/Locality)". 2016 Census QuickStats. Retrieved 5 January 2018. Material was copied from this source, which is available under a Creative Commons Attribution 4.0 International License. ^ "Home". yarliyil.com.au. Retrieved 2017-05-15. ^ "Home". www.balgoart.org.au. Retrieved 2017-05-15. ^ "Warmun Art Centre | Gija Contemporary Art". warmunart.com.au. Retrieved 2017-05-15. ^ "Halls Creek crime 'down' after liquor ban". abcsport.com.au. 1 September 2009. Retrieved 17 January 2017. ^ Statistics, c=AU; o=Commonwealth of Australia; ou=Australian Bureau of. "Redirect to Census data page". abs.gov.au. Retrieved 17 January 2017. ^ a b Shire of Halls Creek, Travel and Tourism Guide, p7, 2015. ^ "Climate statistics for Australian locations". 8 December 2016. ^ Major, Tom (30 November 2018). "Rare earth mineral discovery set to make Australia a major player in electric vehicle supply chain". ABC News. Australian Broadcasting Corporation. Retrieved 30 November 2018. ^ "Halls Creek turning into a hub for rare earths". 27 November 2011. Retrieved 10 September 2012. ^ "Halls Creek population figures" (PDF). City of. Archived from the original (PDF) on October 29, 2007. Retrieved 2 April 2008. ^ "Halls Creek Population figures" (PDF). ABS. Retrieved 2 April 2008. This page was last edited on 24 March 2019, at 10:31 (UTC).